In March of 1850 a group of approximately fifty wealthy women met in a hotel to discuss the plight of indigent females. Among them was Catharine Beecher who urged that the best way to help these women was not to dole out money which would soon be spent; but to train them to earn their own income. She advocated the establishment of sewing classes. “Where is trained handicraft more important than in making, mending, and preserving the clothing of a family?” she asked. From this meeting the House of Industry was founded. It was a startling concept. Society women at the time tended to donate their time and money to religious outreach projects in an attempt to relieve the poor. Charities that focused on the training and education of the poor would not become widespread until the social reform movement late in the century. The idea of needlework classes for impoverished women trying to improve their lot worked nicely for the founders, as well. It conveniently kept their hands unsullied by those other uncomfortable social problems: prostitution and drinking. 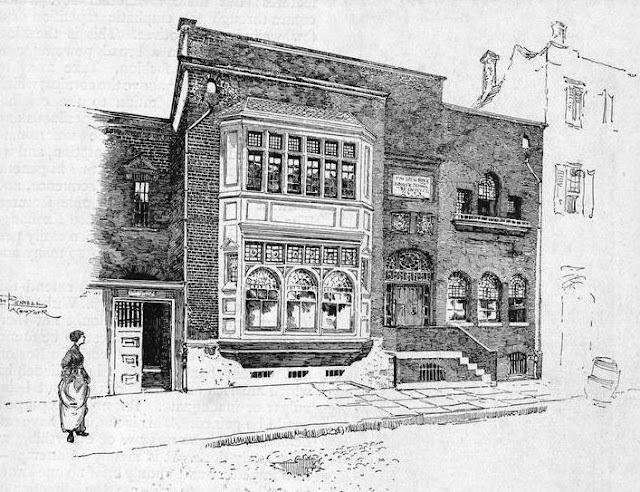 By the end of April 1851 the group had enough money to rent a small wooden house at 120 West 16th Street. The owner, Samuel Shaw Howland, offered to sell the house for $7,000 or to rent it at $450 a year. The women chose to rent; however they had to find a man to lease the house for them. Howland was unwilling to contract business with a “society of mere women,” so the House of Industry was forced to sublet. Later that year the House of Industry was incorporated and by 1852 had accumulated $20,000 in donations—nearly half a million dollars by today’s standards. No doubt with no small amount of satisfaction the women purchased the house from Howland for about $16,000 two years later. The House of Industry was not merely a training place. The needy women were actually employed by the school. Once they were adept at their needlework, they became part of the workforce of the institution and received money for what they produced. Realizing that bulk orders would bring in more income, the managers regularly knocked on the doors of hospitals, asylums, schools and other institutions that required bedding, uniforms, gowns and related items. Because the goods could be obtained at a significantly lower price than commercially-manufactured goods, they were especially attractive to the buyers. An in-house store was initiated for “every article from an iron holder to a woman’s dress or a man’s wrapper,” according to a later annual report. In addition to this “house-work,” the more proficient sewers were given “fine ordered work” to do. Orders were taken for embroidery, braiding, bridal ensembles, quilting and other more intricate work. Not everyone who applied was accepted into the school. If a women was deemed able to work for “service,” in other words as a maid or cook, she was denied. By 1873 it was apparent that the bold experiment in raising indigent women to their feet through training and employment worked. That year’s Annual Report noted that 250 women were working in their homes, assembling garments and other items from already cut goods. The “fine ordered work” department had 35 expert sewers and the women took home over $4,000 combined income that year. That year the Sewing School had an enrollment of 125 girls ranging from 6 to 16 years of age who met for classes twice a week. Here they learned rudimentary sewing skills. The Infant Industrial School was a constant financial drain on the House of Industry, however. In 1877 the group approached the Children’s Aid Society for additional funding for the school. After months of talks, Charles Loring Brace agreed to subsidize $1500 yearly on the condition that the school would garner subscriptions or donations of at least $700 a year. By 1878 the House of Industry was among the favored charities of New York’s most elite socialites. That year Mrs. Minturn proposed that Marion Anthon Fish, familiarly known as Mamie, be accepted to the Board of Managers. One of the queens of Manhattan society, Mamie Fish was unanimously approved. Her esteemed name was added to a membership list that read like a roll-call of the upper echelon of New York money: Astor, Van Rensselaer, Livingston, Gracie and DePeyster among them. Membership required more than money, however. All the women were obligated to donate their time as well. That year it became obvious that the old wooden house was no longer adequate. Mrs. John C. Green donated $15,000 for the erection of a new building. Before the year was ended, the old house had been demolished and a new up-to-the-minute brick structure built. Architect Sidney V. Stratton designed a picturesque structure in the Queen Anne style that was just appearing in New York. Because Stratton’s design is distinctly divided into two sections, at a glance it appears to be two separate buildings. Just two stories tall over a shallow, stone basement, it oozes architectural charm. The great, two-story stone oriel window of the eastern section steals attention from the more modest western half. Stratton employed all the aspects of the new style: terra cotta panels, multi-paned windows, a fish-scale slate roof and quaint pseudo-balcony. 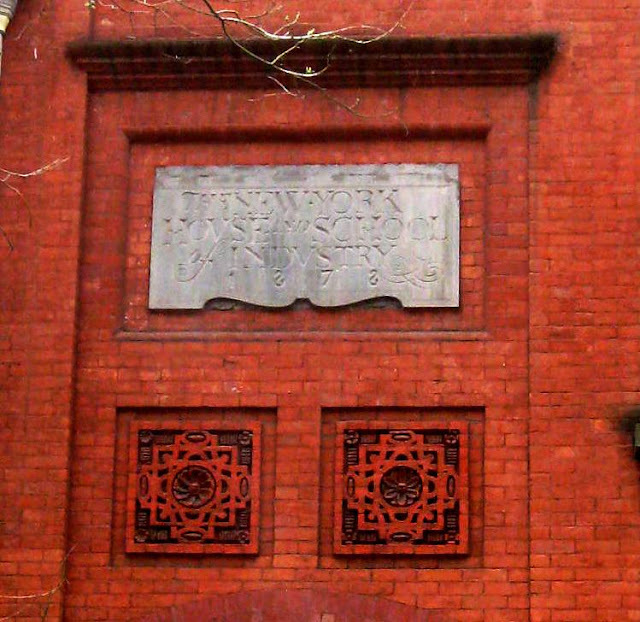 Above two intricate brick-and-terra cotta panels, a carved stone tablet announces the name of the building and date of construction. By 1887 the House of Industry was teaching over 100 youngsters in the sewing school. There were about 150 women employed making over 12,000 garments a year including, according to The Sun, “jumpers, shirts, drawers, aprons, undergarments, calico dresses and wrappers.” The fine-ordered department that year produced what the newspaper termed “some of the finest needlework in the city.” “Many a fashionable bridal trousseau has been enriched by it,” the article said. Today the two-story oriel with its fish scale tile roof and interesting angles and quirks still demands all the attention. For a full century, until 1951, the House of Industry continued its mission at No. 120 West 16th Street; what William Howe Tolman called in his 1902 “The Better New York,” “…not to give charity, but work.” That year the institution merged with the Greenwich Village settlement house, Greenwich House and its focus changed to the needs of aged residents of Chelsea and Greenwich Village. A Jewish charitable organization purchased the building in the 1950s. In 1977 it leased it to the State of New York which subsequently purchased the property a decade later. Today the New York State Office of Mental Retardation and Developmental Disabilities operates a residence for the not-for-profit Young Adults Institute here. The YAI Network provides opportunities to people with developmental disabilities and their families—continuing the original purpose of the remarkable Queen Anne style building: providing hope to the less fortunate of New York City. My adult disabled daughter lives there, and I am so please that you wrote this wonderful article about the history of the building itself. Thank you! I love this building! It’s just so special ❤️ When I was young, my dream was to produce plays here that had to do with immigration or plays about bonding of nationalities. Majority of One was my first plan! But I think the women who founded this would be proud that it’s being used for healing those who have challenges .